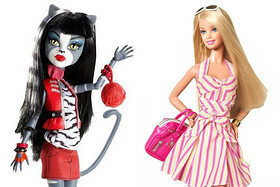 While Mattel’s Monster High dolls have savaged Mattel’s Barbie in the marketplace, what have we really gained as consumers? Monster High’s ‘Frankenstein’, ‘Cleo De Nile’ and ‘Draculaura’ amongst many others – aside from being the offspring of classic monsters – are all about celebrating difference. Barbie had unrealistic proportions, and has been oft dragged across the coals for that, and while Monster High dolls have different proportions to Barbie, their bobble heads, thin joints, extreme foot arches, shortened torso and spinal curvature are also disproportionate. And while Monster High Dolls’ funky hairstyles and gothic fashion choices clearly appeal to a new generation, they aren’t really celebrating difference so much as just being a new type of doll clones. This will, no doubt, inspire a generation of girls to be once again “different” by all being the same. But what we are really seeing here is a change in the makeup and dress code for what is acceptable for young women. Instead of worrying which pastel hued eye shadow to apply, like Barbie, they now have to wonder what neon hair products will best offset the bolts in the sides of their necks. And trust me, there are rules for these things and the bullies will always know them first. But would I buy them for my daughters? And the reason is that, while the Barbie play that I have observed has often involved Barbie role-playing the child doing adult things, Monster High dolls just look as though they would get to have more awesome adventures through play; they probably kidnap Barbies and take over doll houses, and roast Barbie’s horse for a quick snack while applying thick black eyeliner and reattaching the snakes to their heads. And unlike Barbie, who has a tendency to stay at home waiting around for Ken to show up, Monster High dolls – who are the spawn of monsters – can do what the hell they like, Kens be damned! So true, Rianh. Love the imagery. I played with Barbie all throughout my childhood and she never waited around for Ken. She went on African safari’s. Rode her beloved horse Gold Dust and one time she had to find a way to motivate her lazy younger brother (Ken) to get a job- he was a layabout you see. My point is that Barbie, although setting unrealistic physical standards, is a great canvas for playtime. She can be anything or anyone. And more often than not for me, she was a champion. I agree, even rag dolls have unrealistic physical proportions yet do the same thing; provide a canvas for play. I think that monsterhigh is a great role model for young girls. This entry was posted in News, Opinion and tagged barbie, News, Opinion, role models. Bookmark the permalink.